Celebrating Ireland’s dense network of penitential tracks, Pilgrim Paths Week is a new, non-denominational Easter festival that urges us to get into the Irish countryside and follow penitential trails trodden by our forefathers. Local guides will lead each outing, describe the story of the route and explain how medieval penitents coped with their arduous journeys. So, whatever your spiritual convictions, community groups across Ireland are inviting you to take up the pilgrim staff at any of the events listed when Ireland’s penitential paths will resonate to the ageless echo of pilgrim footfall. Honour Ireland’s most beloved female saint. The walk follows part of St Brigid’s pilgrim journey from her birthplace in Louth to the Abbey she founded in Kildare. Authentic, two-day pilgrim walk recreating St Finbarr’s journey from Drimoleague to Gougane Barra. Memorable views and rich archaeology en route. An opportunity to complete a part of the ancient route used by St Declan when going from Ardmore to Cashel. Enjoy a Pilgrim Walk along the ancient Cosán na Naomh accompanied by an archaeologist telling the story of this pre-historic route. Weave your way in the footsteps of St Kevin through the Wicklow Gap to renowned Glendalough, while connecting with awe-inspiring beauty. Cnoc na dTobar has been a sacred site since prehistoric times. Walk follows upwards 14 Stations of the Cross on the mountain’s ancient trail. 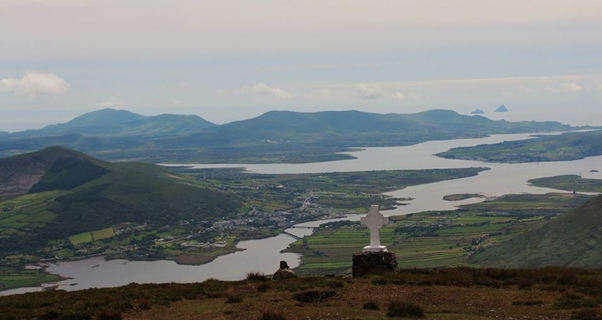 Opportunity to complete half the ancient druidical and pilgrim path to Croagh Patrick. On subsequent days the second part of the Tochar can be completed, if desired. Read the full article in the Irish Times here.